Dave’s come in at a hundred miles an hour and he’s strong within himself and we’ve only done three gigs but it’s sounding absolutely amazing. We’ve had people coming up to us and saying, that’s the best Angels gig I’ve seen in twenty years! The Angels (or Angel City for those in the USA) really don’t need any introduction other than stating quite simply they are one of the greatest rock bands Australia has ever produced. With a few shows under their belts and an with a renewed enthusiasm from both fans and the band alike, it’s full steam ahead for what promises to be an exciting new chapter in the history of The Angels. 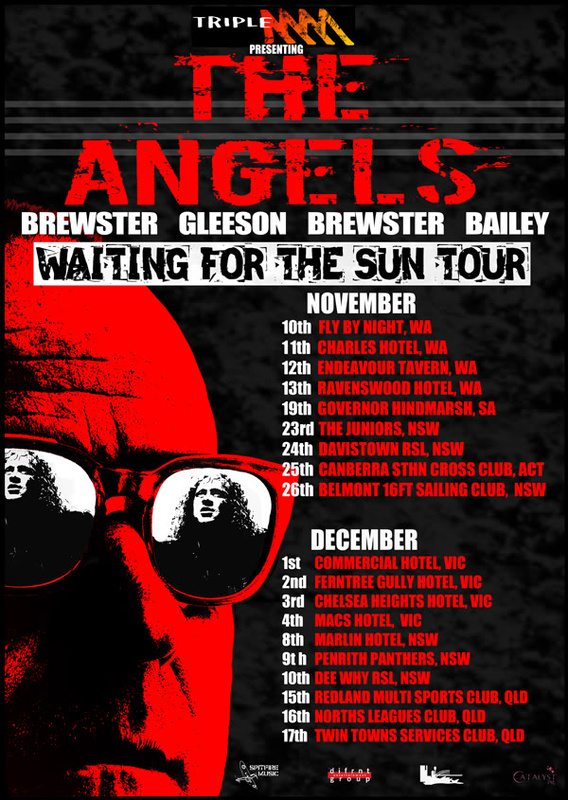 There’s a national tour of Australia kicking off in November and the bands new single and video Waiting For The Sun certainly promises some classic Angels tracks on the new album slated for release in 2012! Getting the opportunity to chat with someone who has been responsible for writing some of the most definitive songs in Australian rock history is the way we roll here at May The Rock Be With You. We introduce to you, John Brewster…. Hey John, thanks for taking the time to chat today! So I hear you have just had an interesting interview experience! Yes I’ve just been interviewed on Triple M by our new singer haha! Dave’s got a radio show, so that was kind of fun, he’s asking me questions about The Angels, which was kind of funny, but it was good! Look, you have posted an open letter to your fans on your website about the situation with Doc, so I am not going to cover any of the how, why, when’s etc. Importantly, you guys have played a couple of shows already with Dave, how did it feel those first few times with him up on stage? It felt absolutely incredible. The idea of Dave was actually my brother Rick’s idea and Rick said look, he’s the perfect guy to sing with us. He’s got such a great rock n roll character, a wonderful voice, he’s very musical and he just fits like a glove. The thing I like about Dave is it’s all about him. He’s a huge fan and I had no idea when I called him and he sort of nearly fell over when we asked him to join us, he said you’ve got to be kidding, I’m such a huge fan. I didn’t even know he was a huge fan, so he already brings to the party a pretty major awareness of all the melodies and stuff and his own thing to us. He’s not trying to be Doc, he’s just being himself. It seems we just landed in the right spot at the right time as the Jets had wound down for a little while and initially we were saying to Dave to just come along as a guest, but it’s really turning into something else. We’ve recorded five tracks together already, we just did a trip to Japan with Jimmy Barnes and that was absolutely amazing. I said to my wife, “look darling you’re not coming on this tour because we’re going to be doing some song writing” and she was like, yeah sure you are! It turned out we wrote five songs! As you just said, you have been writing a bit with Dave, how has that been going so far? When I called Dave and asked if he would like to sing with us, as soon as he said yes, I called our manager and said, “Hey, I’ve got a singer”. And he was like what do you mean and I said, I’ve got a singer and he was like, well who? I said Dave Gleeson and he was like cool, well that will work. The next call was to Alberts, we have had a long association with them and I spoke to Phillip Mortlock in there and told him that Dave Gleeson is joining the band and I don’t want to go into all the details, but he’s joining the band and we need some studio time and he’s like well come on in. So we recorded five tracks and we are going to go in again in the first week of November and going to record these songs we wrote in Japan, so we are going to end up with a new Angels album. Ok so I had seen earlier reports of maybe a new EP, but it’s definitely going to be an album you plan to release? Well to me, it’s really important we don’t just rest on our laurels. We’ve got a lot of big songs and obviously we will still be playing all of those songs on the upcoming tour as that’s what they come to hear, but it’s very important to me that we do something new and we haven’t been able to do that in years. Dave has injected a new lease of life into the band. Without going into all the details, we had felt a little bogged down and I guess the thing is, any outfit is only as strong as the weakest link. If you’ve got somebody who’s not really into it, it will drag you down. Dave’s come in at a hundred miles an hour and he’s strong within himself and we’ve only done three gigs but it’s sounding absolutely amazing. We’ve had people coming up to us and saying, that’s the best Angels gig I’ve seen in twenty years! Coming up you have a National Tour, which is a true national tour, as opposed to just the capital cities. Was that an important thing you guys wanted to do, given that pub rock tradition is your heritage? You know, that’s what the band is all about. From day one when we formed The Angels, we’ve been on the road. When we first started doing a song like Be With You, people would be going to get a drink during the song as it’s one of our slower ones, now it’s one of the biggest songs in our repertoire. The thing is most of our songs were written in front of people or been road tested in front of the people, so there’s always been that close connection. With over 30 years of material to choose from, where are you guys at when it comes to choosing a set list these days, are you allowing Dave to indulge in picking a few of his favourite tracks haha? Absolutely. We are pretty much on the same page anyway. Some of the songs we sometimes do or sometimes we don’t, for example Fashion and Fame, well that is one of Dave’s favourite songs so we will do that on the next run. Dave being a bit younger than us, some of the songs that are the real biggies for us, well he was exposed to some of our later songs that we wouldn’t necessarily choose to do. A song like Small Price for example that was on the Two Minute Warning album, we actually recorded that for the EP. Dave said that’s such a great song and we were like, yeah you’re right, let’s do it. In this far more accessible world that we now live, how have you noticed The Angels demographic changing over the years, have you noticed a lot of younger generation getting into the band? I reckon if you came to an Angels show you would be amazed at how many young people come. It always surprises us and we’ve never quite gotten used to that. You look out and think, there’s so many 18yo’s and 20yo’s and 25yo’s. I remember doing a show here at The Governor Hindmarsh one time and their license is such that you can actually have under 18’s in the room and the whole front row was filled with 12yo and 13yo, both boys and girls and all of them were watching Rick and I and our hands and our every move on the guitar. Oh so that’s how they play that riff, or that’s how they play that chord. You realize that our music is so relevant to these people. When we wrote these songs, we didn’t really write about an era, we didn’t really write too many songs about young love. Be With You and Love Takes Care are about our closest two romantic songs and they aren’t they romantic either! Songs like Take A Long Line, they are still so relevant today. A lot of that poetry and lyrics are Rick, he is just such an incredible lyricist, songs like Mr Damage, the lyrics in that song are extraordinary. I think people just get off on the imagery. Like I said earlier we didn’t just write about a specific era, we just wrote these songs. You could probably relate to this too, if I listen to La Grange by ZZ Top today, it’s as relevant as it ever was. There’s a simple song where mostly all he sings is “ha, ha, ha…”, but they are great rock performances. There’s the other thing, the songs have a real atmosphere and they live on. We still get a lot of air play so young people get to tune into radio stations and hear The Angels a fair bit and then come along and check it out. 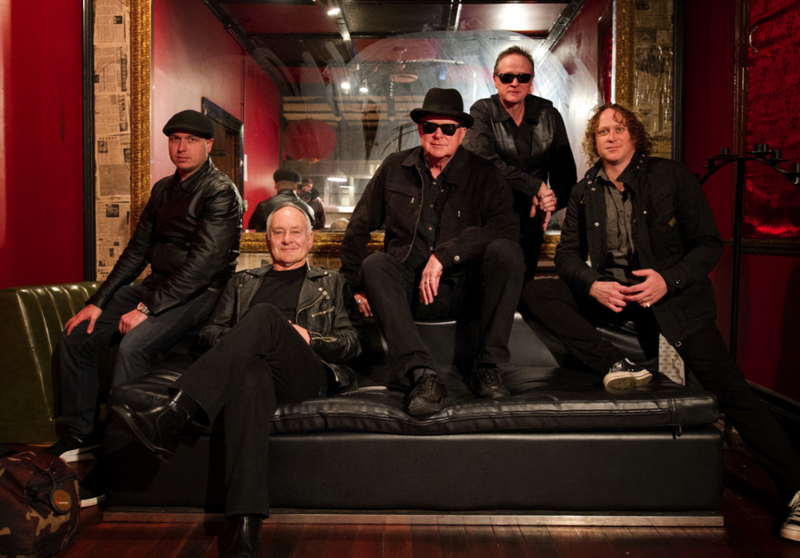 As one of the pioneers of Aussie pub rock, I see you are taking a few younger bands out with you on your Waiting For The Sun tour, which is something you have always done, even going back to the likes of Baby Animals back in the 90’s? We love to give people an opportunity and the better they are, the better our show is by the way. We give them everything to by the way, within reason. We grew up in that environment ourselves, our best friends in the early days were AC/DC. They basically got us our first record deal, Angus, Malcolm and Bon introduced us to Harry Vanda and George Young and that’s how we got our first record deal. We used to do lots of gigs with them and they would give us the whole PA, light show and everything and some nights we would give them a run for their money. Even on the Back In Black tour they came up and said “you’ve beaten us tonight” and I’ll always remember that as nobody has ever beaten AC/DC. That night we were absolutely on fire and their attitude was the better the support act, the better they are going to go over and we’ve always been the same. I was reading just a few days ago that the US version of Face To Face under the Angel City name is about to be re- released. Now what about the legacy of the band overseas, do you have any idea of how strong that is in 2011? Ok, well that’s interesting, I hadn’t heard that Face To Face was being re-released over there. Well the thing is, we did five tours of the USA and not everybody realises how well we did over there actually. Certain regions, we were doing our own shows to crowds of 8,000 to 10,000 people. The problem for us was we kept trying to do it out of Australia. We would take an Australian road crew, as we were very loyal to those who worked for us, but the operating costs for touring overseas were huge. Whilst we could do really well in certain regions, other regions we would be playing to clubs of maybe only a few thousand people, they would still be full, but it just wasn’t enough income for us to continue that process. See bands like AC/DC that went over there and lived there, continued to build, but it took them a while too. I don’t know, maybe we were too conservative and we were just a few years older than those guys and we were starting to have children in our lives and it was starting to become too much of s monumental effort to relocate overseas. We had such an incredibly strong power base here in Australia and what we would be doing is tour America and come back and pay the debts off by touring here. Consequently, we really did build a good name for ourselves there. Songs like Marseilles which I wrote and Take A Long Line which Rick wrote, they still get airplay over there and bands like Guns N Roses used to play that song in their set. Then there’s a band like Great White who also recorded a couple of your songs! Yeah they did Face The Day and Can’t Shake It. There are a lot of bands that have done covers of our songs and there’s still a lot of interest. And you’ve just given me a piece of news earlier, as I didn’t realise that Face To Face was being reissued. So just on the Face To Face album, what was with the different track listing? Well I always thought the US made a mistake with their version of Face To Face as it’s actually a hybrid of Face To Face and No Exit. I always felt that we should have released Face To Face as it was and then No Exit. I went over there and did all the remixes and mixed it so it would all fit together but thought the album lacked the depth of the original. The Angels wasn’t just about full tilt rock n roll, you listen to songs like Outcast and Dawn Is Breaking, there’s another side to the band other than just a straight ahead rock n roll band, that I think those albums brought out. It’s a shame America went with their version of Face To Face and then to the Darkroom album, it’s too radical a change. But if you go Face To Face, No Exit and then Darkroom, it all makes sense. So with a national tour soon to start and new songs being worked on, when are you realistically looking to have the album out? Well we would love to get an album out in the early part of next year and I think we are on target for that, but you never quite now. Heading into a studio, it’s kind of a voyage thing, you never quite know where it’s going to take you. I’m very confident that with the new injection of Mick and Dave that we will knock out an album reasonably quickly. You know if Waiting For The Sun is any indication of what’s to come then it promises to be a great album! Thanks very much for saying that, you know it’s not an easy thing to do. Rick and I quite intentionally wanted to write a song that sounded like The Angels but of course with Dave Gleeson singing. We sat in the front kitchen of my house in Victor Harbour looking out at the sea and we got the electrics out and small amps and turned it up and knocked out that song. I think we got it right actually, I really like the song and it suits Dave as a singer. Talking about the songs we wrote in Japan we got some good stuff there and things will happen in the studio too. Well, I certainly look forward to catching the show in Melbourne when you come through. You know Melbourne really is quite special to us, but I suppose I could say that about everywhere. But Melbourne is quite special, I remember back in the early days of The Angels, certain regions were harder to please. It was like if you could win Melbourne audiences, then you’ve really got something special going on. It’s now a major fan base for us and we are looking forward to getting back there and playing again! Well John, thanks for giving up so much of your time for this interview, it’s been a truly awesome opportunity to chat with you! Thanks a lot Scott, it was great to chat with you mate. Cheers!